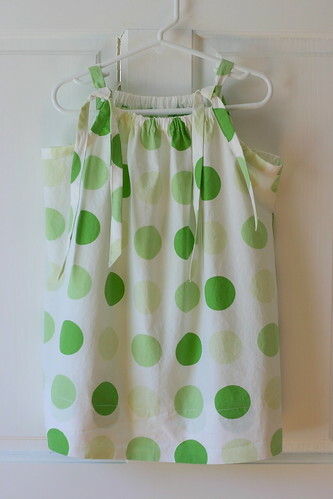 Charlotte’s Pillowcase Dress, originally uploaded by SewLaTea. I’ve been wanting to make this dress for months now…so while procrastinating the Birdie Sling, I decided it would feel real good to actually COMPLETE a project! I knew this one was waiting for me and wouldn’t take too long, so I decided to tackle it. I used this tutorial by Freshly Picked. It was a great tutorial…very easy to follow and I like how Susan uses elastic in the top. I think it gives it a sweet look 🙂 I had considered adding a little flower broach so I made a yo-yo flower using this tute by Heather Bailey. I used the leftover fabric from the dress to make the flower. It came out a little small, so I didn’t add it. But I still think I might make a couple to embellish…we’ll see! Anyway, its getting late and I have two sick kiddos wanting mom. Night night.